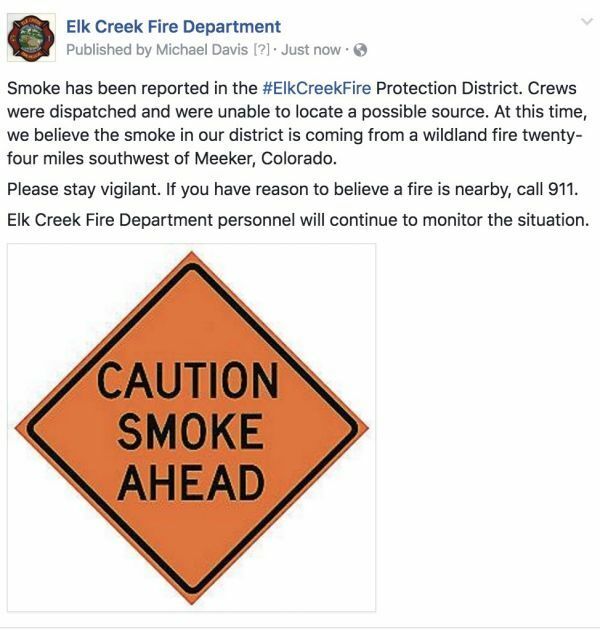 Smoke has been reported in the #ElkCreekFire Protection District. Crews were dispatched and were unable to locate a possible source. At this time, we believe the smoke in our district is coming from a wildland fire twenty-four miles southwest of Meeker, Colorado. Please stay vigilant. If you have reason to believe a fire is nearby, call 911. Elk Creek Fire Department personnel will continue to monitor the situation. i'm smelling somewhat strong smoke this morning, but not seeing any up toward elk falls. however, i do have a partially obstructed view. anybody else smell/see anything this morning? smoke does smell "fresher" than i'd think it would traveling all this way from flattops. The smoke smell started quite strong yesterday afternoon. I could see the smoke blowing southwest towards the flat lands; especially during sunset. The smell is still very storng this morning to the point I am not opening my windows. Also remember it is colder now in the morning and evening hours and not everyone uses gas or electric for heat. They are using their woods stoves. Speak the truth always & safeguard the helpless. Could it be drifting from the fire near Lyons? Or the huge fire down by Pueblo.